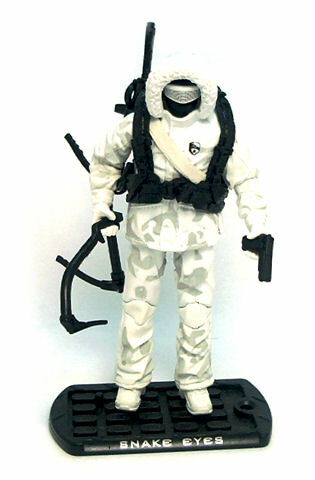 Arctic Assault Snake Eyes was released in 2009 as part of Hasbro’s third wave of figures in the G.I. Joe: The Rise of Cobra toy line. 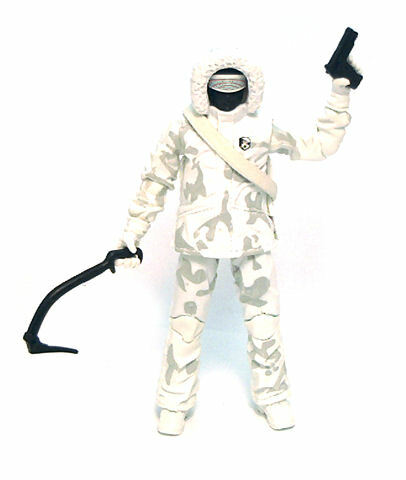 Since this is a movie inspired figure, the silent commando dispenses with the black ensemble he normally wears pretty much everywhere in comic books and cartoons, and instead comes attired with proper cold weather garments. 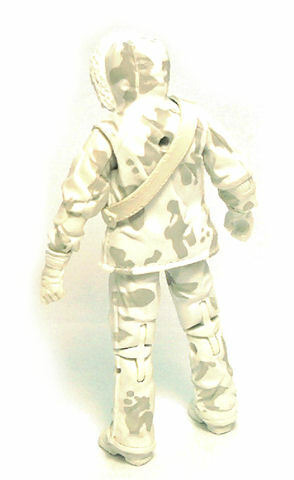 This Snake Eyes is molded entirely in dense white plastic, with the head painted matte black. 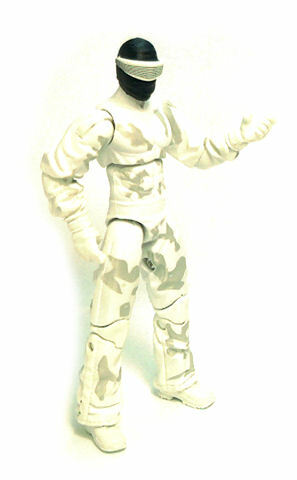 Paint operations were kept to a minimum here, consisting on light gray camouflage spots applied all over the figure and thin, crisp black lines on Snake Eyes’ visor. Normally cold weather equipped figures tend to be fairly bulky and featureless, or look like they have an arctic survivalist costume on. However, Snake Eyes wears what seems to be the latest in experimental textile materials. His uniform consists of a white hooded parka, snow pants, gloves and heavy insulation boots. The one thing that caught my attention with this figure was the amount of detail it has, since the entire surface of the garment has small folds, wrinkles and stitching sculpted on, effectively selling the illusion of it being made from some sort of ultra thin space age insulated material. 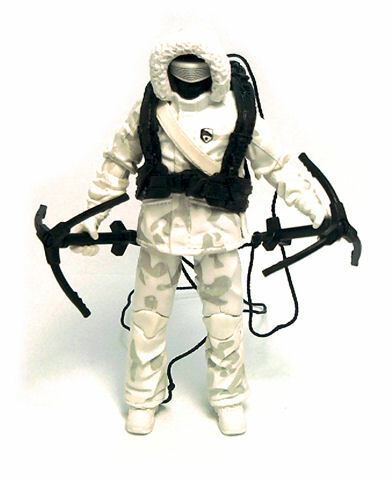 The body of the parka is removable, and underneath we find that the waist and torso pieces are the same mold as the Ninja Commando version released in wave 1, although also molded in white. These are very slim pieces that work wonderfully with the parka vest and showing Hasbro’s willingness to go one step further, were also given gray camouflage paint apps. • Ball jointed neck. Rendered pretty much useless by the parka hood. • Peg & hinge shoulders. Excellent motion range and very well concealed into the design. • Peg & hinge elbows. These can bend almost to 90°, but sideways rotation at this angle has some issues. • Ball mounted torso. Works basically as a swivel due to the parka. • Ball jointed hips. Good motion range, but again, the lower edge of the parka gets in the way for sitting poses. • Peg & hinge ankles. These have only limited swivel and even less range of motion back and forth due to the way the pant cuffs are sculpted. Like with the Duke or Cobra Para-viper figure, articulation is compromised by an accessory (the parka), but Snake Eyes (like Duke) comes out at the other end unscathed, as the involved joints still retain enough range to be useful or have their slack picked up by another joint. In terms of equipment, Arctic Snake Eyes has a pistol, a pick, a katana sword and a bulky black backpack. 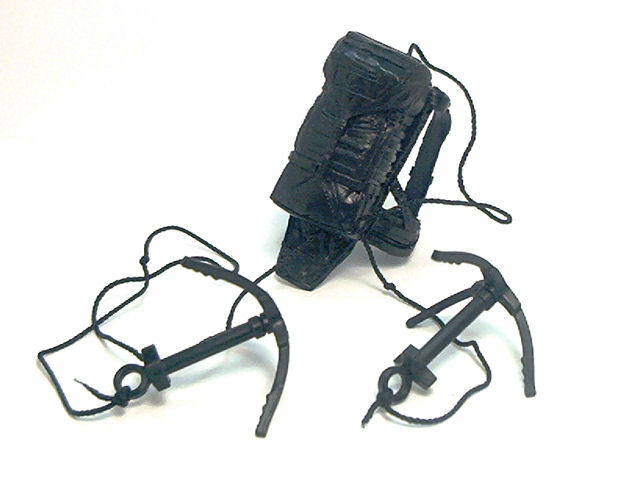 Since this version of Snake Eyes doesn’t have a big spring loaded launcher, the gimmick is built into the backpack and consists of a piece of black cord running through it and connecting a pair of black grappling hooks; the cord isn’t long enough as to be actually useful, but as play features go this isn’t a bad idea. Like any of the other basic figures in the line, Arctic Snake Eyes comes with a personalized dog-tag display base done in the RoC style and has the character’s name printed on the front bevel. Arctic Assault Snake Eyes is easily my favorite figure from this wave, due to the solid design and the choice of accessories included with him. It is also a fairly unique look for a character that has had over forty versions made of him over the years. I’ve always loved cold weather gear figures. I wish I had picked these up.